Happy Holidays and a Happy New Year to one and all. Some time back, I had the pleasure of receiving a copy of The New Gothic [Amazon | B&N | Powell’s], edited by Beth K. Lewis, from my friend, S. J. Chambers, who ran a contest on her blog connected with the story that she co-wrote for the anthology with Jesse Bullington. I can say with a clear conscience that I enjoyed reading it very much, however biased I might be, and I think you might like this book as well. It’s been reviewed at i09, among other places. It’s a good, short anthology featuring a number of truly powerful stories. What kind of stories? “Dive in Me,” Jesse & S.J.’s offering, is Dirty Southern Gothic. It paints a grungy, 1990s picture of Florida, centering on a trio of girls who are going to a Bad Place. Is it evil? Haunted? Not everything is fully explained, much like the cold water you’ll find in it. It’s a strong opening to the anthology, and it captures the time very well, bringing a fundamentally Gothic experience into a lush, overripe setting that seems built for the experience. “The Fall of the Old Faith,” by Ed Martin, has mysteries at its heart, both a secret cult and a climax from which the camera turns at the last minute. Kurosawa said that being an artist means never averting your eyes, but in this case it makes sense. How troubled or sane is the narrator? Difficult to say, but it’s a more gentle madness than you’ll find in most of Poe or Lovecraft, and it feels authentic. The story gets some bonus points for its explicit frame, which really helps to evoke mood. The biggest surprise to me in these pages was Laura Ellen Joyce‘s “The Death Bell.” The surprise comes not just from the story, but from the fact that I’d never heard of her, and the story is brilliant. Finding a writer whose work simply blows you away just isn’t an everyday experience, and I’m grateful for it. The story is short, and I can say little without ruining it (“there’s someone who sleeps, and also a date!”, but I would have counted reading this anthology a win for “The Death Bell” alone. I’ll be seeking out and reading more from this author. Fi Michell‘s “The Debt Collector” is set in 1936 and plays with the tropes and the emotions of the Gothics, and it manages to breathe some new life into that tiredest of Gothic corpses, the vampire. Too often, that particular character is a caricature, or is defanged by adherence to clean, clear rules. Not so, here, and you’re sympathies will migrate along with your conclusions. Those stories particularly struck my fancy, and I also very much enjoyed Dmetri Kakmi‘s “The Boy by the Gate” and Sean Logan‘s “Viola’s Second Husband.” I omit coverage of Ramsey Campbell’s story only because it is inimitably Ramsey Campbell, and therefore excellent; one can only shrug and marvel. If you like Gothic, if you like horror, or if you like the Weird, there’s something for you in this well-edited collection of stories. Kudos to the editor for putting together such a good book, and kudos to Stone Skin Press for making it an attractive book. So many paperbacks are cheaply made, and it’s a pleasure to hold something in your hand that feels durable, looks good, and will stand up to the rereading it deserves. 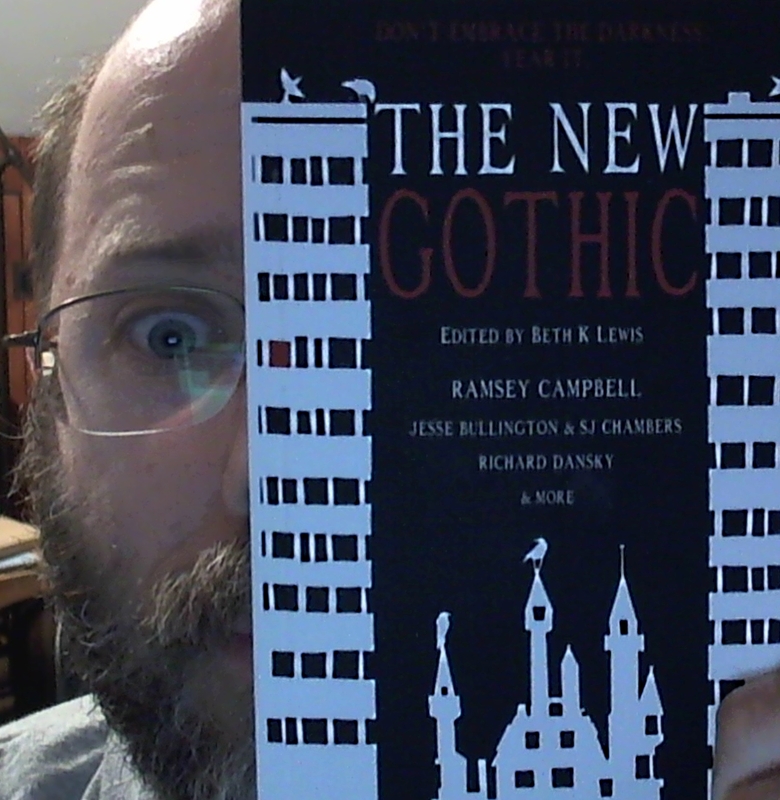 Yesterday I received a copy of The New Gothic in the mail, courtesy my friend and intrepid correspondent, S.J. Chambers. 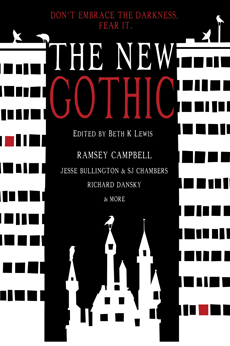 This anthology is, no surprise, a collection of contemporary stories about the Gothic, edited by Beth K. Lewis and featuring a variety of writers, including the immortal Ramsey Campbell. Things get off to a terrifying start with Jesse Bullington and S.J. Chambers’ “Dive in Me.” It pushes so many horror buttons, from the crushing insecurity of youth to the simple fear of drowning, and it builds to a stunning climax, the kind where you’re sort of breathlessly turning each page as your eyes gradually get wider and wider. This one will stick in my head for a long time. Today’s Monday, and what does that mean? The aforementioned posts in the My Writing Process blog tour from two of my writerly friends. S.J. Chambers writes about cutting up manuscripts, theming wine, womanhood, and the poverty of marketing labels when discussing writing. Mark Meier writes about word play, German literature, and making the world a better place.